L: 30" x W: 30" x H: 29"
Conrad Leather Swivel Accent Chair Relax in style with this generously scaled, European-style Conrad leather swivel accent chair in antique red. The bicast leather is soft, durable and breathable for added relaxation and quality. This swivel accent chair is engineered for timeless comfort while displaying exceptional detailing and tailoring, so it truly offers quality and style that you can see and feel. Relax in style with this generously scaled, European-style Conrad leather swivel accent chair in antique red. The bicast leather is soft, durable and breathable for added relaxation and quality. This swivel accent chair is engineered for timeless comfort while displaying exceptional detailing and tailoring, so it truly offers quality and style that you can see and feel. We loved this chair and get many complements from friends, however recently the color is flaking off and we can't understand why. The chairs are an eyesore now and we are having to cover them. We have had them for 9 years. 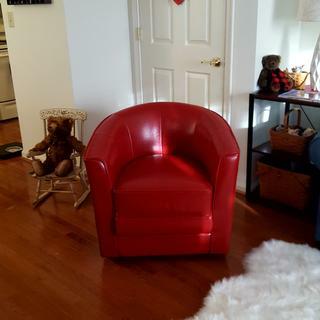 I purchased 2 red for chairs for my living about 6 years ago. The color is beginning to flake off on and around the seat. It's really strange because they were barely sat in and they are flaking. I am not happy about it. I will have to purchase 2 more different kind of chairs, but cover these two in the meantime. Very lovely , enjoyable & relax chair. We Recommend to everyone . Great Household Addition . . . Comfortable, compact, stylish chair that gets more pleasurable with every sitting. Easy to purchase, delivery prompt, and use all high quality. We've had this chair before in a different color. We love this chair and it's very comfortable. It fits just right in the corner of the living room. Perfect for my home office and decorating wise accents black, glass and purple. This is one great chair and it looks so good in the corner of my bedroom. It looks a lot more expensive that it was! Purchase this a few years ago when we remodeled our basement. The red is really nice and the materials are durable. Also look pretty dang good with the decor. I purpose bought this chair for my daughter who is 5 years told. Both of us love it. it is very comfortable and flexible as it turns 360 degrees. The color and leather style give the impression of high quality. It goes well with a similar chair in Green we bought a few years ago. I was very happy that Wendy asked me to sit in this chair. I had looked at other accent chairs. I wasn't a fan of leather before but this chair was just comfortable and perfect for my room. This chair added so much heart to my apartment! I love it! Hello Anna Marie and thank you. all products more than satisfactory. Just waiting for chair ottoman to complete my new living area. Red was a great choice. This product is the beautiful in the home I love the swivel and the comfort of the chair. We love our red leather accent chair. It is very comfortable, and the swivel is a very nice feature offering lots of flexibility for how, and where we use the chair. The chairs look great. Love the color and leather feel. The swivel function is great and it looks good with other coordinates in the room! in the past year the bonded leather began cracking and flaking and looks absolutely terrible. It is a shame because they were very comfortable and stylish. Now there is no way to cover or fix them, they are headed for the trash heap. they were just as expensive 5 years ago, therefore would NOT recommend!!! Don't ever buy this chair. It is not real leather. It is bonded leather which strips off. I've only had these chairs (I bought 2) less than 2 years, and the leather is stripping off the chair and it is an eyesore. Raymour & FLanigan repair people came and looked at it and said it couldn't be repaired and "sorry". I now have to pay $350 (about the price I paid for each chair) to get them reupholstered. I had to give 1 star as there is no other option otherwise it would be a 0. Does the Conrad Leather Swivel Accent Chair do a 180 or 360 swivel? BEST ANSWER: The Conrad Swivel Accent Chair rotates 360 degrees. BEST ANSWER: The item weighs 67.62 lbs. Does R&F sell slip covers? Mine is flaking and we'd like to keep it. BEST ANSWER: We do not currently carry any slip covers. how high is the seat cushion from the ground? Is this chair available in fabric? BEST ANSWER: I'm sorry. This chair is only available as shown. Is the top cushion from the chair removable for a lower seating height? BEST ANSWER: No, the seat cushion is not removable. BEST ANSWER: Yes, this is real bicast leather. Who manufactures/ makes this chair? BEST ANSWER: This is made by Bellanest, our Raymour and Flanigan exclusive brand.